Modi on the bridge: Never miss a phot op. Prime Minister Narendra Modi inaugurated the strategically crucial and India's longest 9.15-km river bridge connecting Assam and Arunachal Pradesh near the China border and made a veiled attack on the previous Congress-led government for "delaying" its construction. 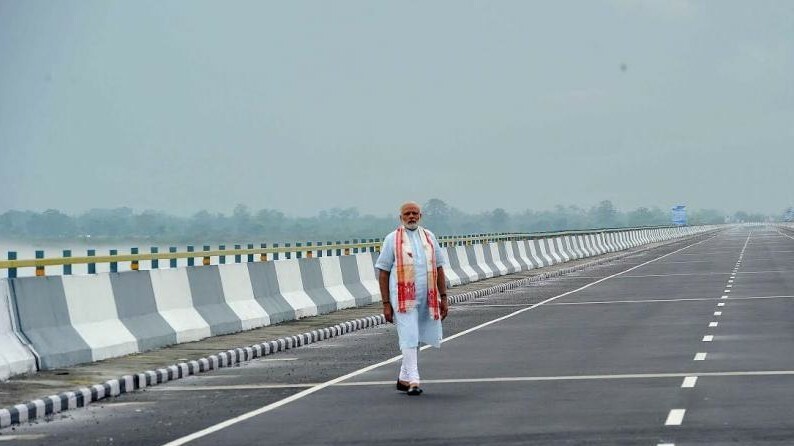 Marking three years of the BJP-led central government, Modi named the bridge — built over Brahmaputra tributary Lohit and linking Dhola in Assam to Sadiya in Arunachal — after music maestro late Bhupen Hazarika. “Our government has decided to name the bridge after a son of the soil, who is the son of Brahmaputra, a worshipper of the Brahmaputra. He is late Bhupen Hazarika,” the Prime Minister told a well-attended gathering here. The bridge, which can bear the weight of a 60-tonne battle tank, will provide a road link to various strategic locations in the region and make civil and military logistics movement easier for Arunachal’s Anini, some 100 km from the China border. The bridge constructed at a cost of Rs 950 crore will also reduce travel time for the military supplies to reach the border areas in Arunachal’s Dibang and Anjaw — a tedious journey that otherwise takes about two days. Modi said the bridge will lay a new beginning for economic revolution not only for the region but the entire country. After throwing it open to the public, the Prime Minister said the bridge would connect and bring closer the people of Assam and Arunachal. The travel time from Dhola to Sadiya through another route would take some eight hours. Through the Brahmaputra river ferry, the journey would take about four and a half hours. Now, the same journey will take only 30 minutes. “The bridge will not only save money, reduce travel time but it comes as a foundation for the beginning of a new economic revolution. That’s why the whole nation has its eyes on this bridge. This region can play a huge role in connecting India to Southeast Asia,” Modi said. After the inauguration by cutting the ceremonial red ribbon, the Prime Minister walked for a few meters on the bridge, saluted the mighty Brahmaputra river, waved to the waiting people and drove with his cavalcade for about 2 km on the bridge towards Sadiya before returning to Dhola to address the gathering. He said the previous Congress-led UPA government delayed the project after it was conceived by then BJP Prime Minister Atal Bihari Vajpayee in 2003 and the people in the region had to wait for five decades for it. “If Atal Bihari Vajpayeeji had returned to power in 2004, then you would have got this bridge 10 years ago. But then another government came to power due to which your dreams were delayed,” Modi said. The project got approval in 2009 under the Congress-led UPA government, and construction began in 2011, under the Tarun Gogoi-led Congress government in Assam. The Prime Minister arrived in Dibrugarh Airport with Union Minister of Roads and National Highways Nitin Gadkari and headed straight to Dhola accompanied by Chief Minister Sarbananda Sonowal and Governor Banwarilal Purohit.